There are three groups (families) of crocodilians: the alligatoridae, which includes the alligator and the caimans; the crocodylidae, which includes the "true" crocodiles; and the gavialidae, which contains only the gharial. Air Travel is more convenient mainly due to its speed – train could be more spacious but air the fastest. Movement of merchandise from one place to another is insured under Marine Cargo insurance. It is not only goods, though not so frequently, animals also get transported. I had earlier posted on transportation of - Tomistomaschlegelii in transit and the insurance aspects of such things in transit. If you are wondering what it is – it is a freshwater reptile native to Malaysia and Sumatra resembling a crocodile with a very thin and elongated snout, which is thicker than gharial. That transportation was arranged in a temperature regulated container with specific arrangement to keep segregated from the rest of the cargo by a wire mesh. If you are a Marine Insurer interested in providing coverage for live animals in transit – experience can be far different from that of meat animals of chicken, sheep, cattle to others – one needs to study, analyse and understand the risk a lot. Besides the health condition of the animal, one needs to understand of the climate adjustment, how the animal would be placed on the hold ensuring that it does not become wary and frightened. Generally, animals are given adequate rest before loading and tranquilisers are not to be used until sedation is compulsorily required. 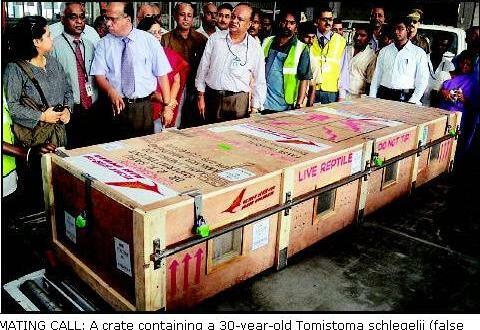 That giant reptile reached Chennai safely that time, though insurance was not probable as it was for a zoo programme. On Thursday, AI-981, the 5.20pm Air India flight from Chennai to Ahmedabad had two rather unusual first-time flyers - a pair of African slender-snouted crocodiles.The critically endangered crocodiles, on their way to Sundarvan Nature Discovery Centre in Ahmedabad from the Madras Crocodile Bank, were transported free of cost by Air India as part of corporate social responsibility. It is reported that presently, there are no crocodiles at the Sundarvan Centre. The female crocodiles, weighing around 120kg each, were transported in covered boxes and confined to a separate compartment for safety. 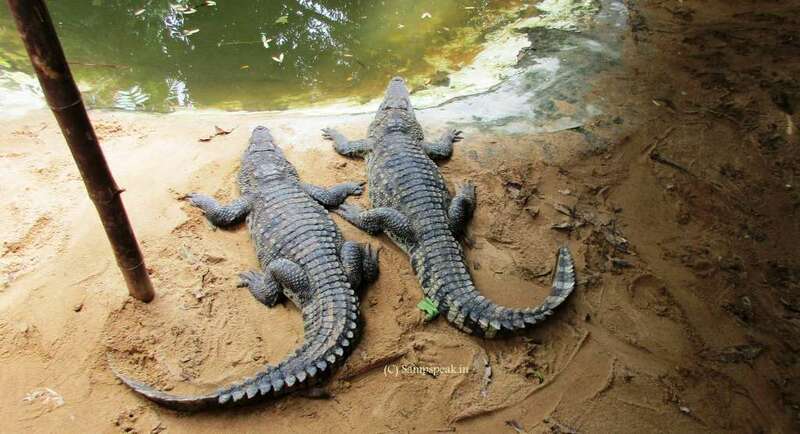 Reports quoting the curator of Madras Crocodile Bank, stated that the mouths of the crocodiles were secured with rubber bands, the animals were not sedated. "Transport by air is less stressful to crocodiles as the temperature is controlled inside the aircraft and travel time is much lesser than road travel” the assistant curator was quoted as adding. The transportation was in a well-ventilated but covered box to ensure that the special guests did not feel threatened by a change of environment. The crocodiles have been gifted to Sundarvan by the Madras Crocodile Bank Trust. At Sundarvan the new visitors will be kept in a newly made enclosure and will be acclimatized for three weeks to their surroundings before they can be seen by visitors. The under-construction interpretation zone will allow visitors to see the reptiles from eye-level. Zoo official is quoted as stating that the last crocodile of the zoo died in 2010 of old age. "We had requested the Madras Crocodile Bank in Chennai, home to over 2,000 crocodiles, to spare us a pair and they graciously accepted the the proposal," he said. In 2010, it was a female crocodile specially flown in from the Ahmedabad zoo for a mating programme in Chennai, where a healthy male of her species awaited her. The crocodile, a 30-year old Tomistomaschlegelii (or false gharial), flew, landed at Port and driven to a special enclosure at the Madras Crocodile Bank. Tomistomaschlegelii, a freshwater reptile native to Malaysia and Sumatra is an endangered species. The false gharial, also known as the Malayan gharial, resembles a crocodile with a very thin and elongated snout, which is thicker than the gharial’s. Nearer the famous Thiruvidanthai is Madras Crocodile Bank, started in 1976 by herpetologist Romulus Whitaker at the time when the Indian government protected all three species of Indian crocodilians under the Wild Life Protection Act of 1972. Now it is stated that there are more than 1,800 crocodiles of 17 varieties, out of which four are endangered species housed in the bank. Well, if you come across a similar proposal – would you be inclined to offer coverage ?